One of the most interesting myths of Hinduism is the Churning of the cosmic ocean, in Sanskrit the Samutramanthan. 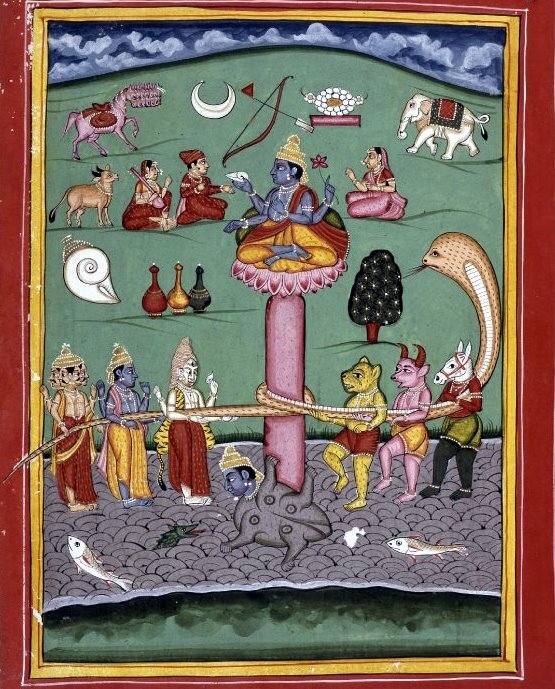 The gods and asuras, dangerous demons, always fighting each others decided for once to make alliance to churn the infinite cosmic ocean and bring out the amrita, the nectar of immortality (in Sanskrit : "a" privative "mrit" = death). To achieve their goal, they used as a “mixer” mount Mandara and plunged into the ocean resting on Kurma, the tortoise in which Vishnu had turned in his second avatar. Once placed on the mountain tortoise, they wrapped around it like a rope the snake Vasuki Nagaraja, the king of snakes. The demons grabbed the snake from side of the many mouths and the gods from the tail and they began to pull Vasuki from side to side by turning the mount in this way the cosmic ocean from which gigantic waves arose. But from the ocean arose a terrible poison halahala. According others tradition the poison did not emerge from the water, but it was spewed from the mouths of the snake. However things went, the terrible poison began to destroy everything that existed until Shiva intervened and swallowed the poison saving the existing. The poison did no harm to the great god, except to paint his neck at the troath blu, which is why the great god is also called Nilakantha, ie the blue troath. A few drops of poison fell upon the earth and for this there are several different plants and animals that are poisonous. Having escaped the danger, the gods and the asuras went back to churn the ocean and from waters Chaturdasa Ratnam, i.e. fourteen wonders, came out. 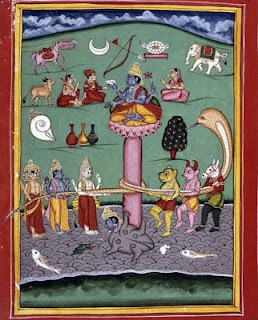 The fourteen things desirable are: Amrita, nectar of immortality; Lakshmi, the goddess of fortune, wife of Vishnu, Dhanvantari, the physician of the gods who brought the cup with nectar; Sura the goddess of wine; Chandra, the moon; Rambha apsara or the vessel Pushpak; Uchchihsravas, the white horse; Airvata, the white elephant vahana or vehicle of Indra; Parijata, tree of heaven; Kaustubha, the jewel of Vishnu; Kamadhenu or Surabhi, the cow of abundance; Sankha, the shell of Vishnu; Dhanu, the arc of Rama; Visha, poison and medicine. Of course, when the amrita came out the gods and demons fought for possession, the fight lasted twelve days and twelve nights. During the fight from the pot (Kumbha in Sanskrit), fell four drops of nectar, in these places the holy cities of Allahabad, Haridwar, Ujjain and Nasik were born. In these cities every three years the great religious festival of Kumbha Mela is celebrated (in sanskrit festival of pot). The asuras seized Amrita. The gods then turned to Vishnu who became Mohini, a girl of infinite beauty. She was able to steal from asuras the cup of Amrita and to bring it to the gods.